Politicians also have a penchant for yelling “fire” about smoke-free devices. U.S. Senator Richard Durbin and Democratic colleagues in the House and Senate issued a report in April titled “Gateway to Addiction” (here). The term “gateway”, obviously used as an attention-grabber on the cover, appeared only once in the text -- as a nonspecific example of how e-cigarettes “could also increase public health risks” for non-smokers. This should sound strikingly familiar to vapers (e-cigarette users) and tobacco harm reduction advocates. As they did with marijuana, prohibitionists make the gateway claim against e-cigarettes in the near-total absence of “definitive and convincing evidence” of harm. Swedish researchers from several institutions document that snus use is not associated with atrial fibrillation (commonly known as AFib), the most common heart arrhythmia (irregular timing of the heart beat) and a risk factor for stroke (abstract here). The same group previously reported that snus use conferred no significant risk for heart attack (discussed here) and stroke (here). 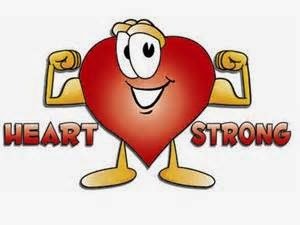 Although smokeless tobacco cannot be proven to be absolutely safe, this study adds important evidence that any cardiovascular effect is very minor. Given the number of institutions represented by its authors, the report is an important development for tobacco harm reduction. In contrast are the biased 1990s and 2000s studies from the Karolinska Institute. There, a small group of KI researchers had access to the construction workers’ cohort and refused to share the data. Instead, they manipulated the information to fabricate some health risks and amplify others in snus users, a fact which I documented in numerous blog posts (examples here, here, and here) and in letters to journal editors. A fresh National Survey on Drug Use and Health summary (here) confirms low tobacco use by teens. 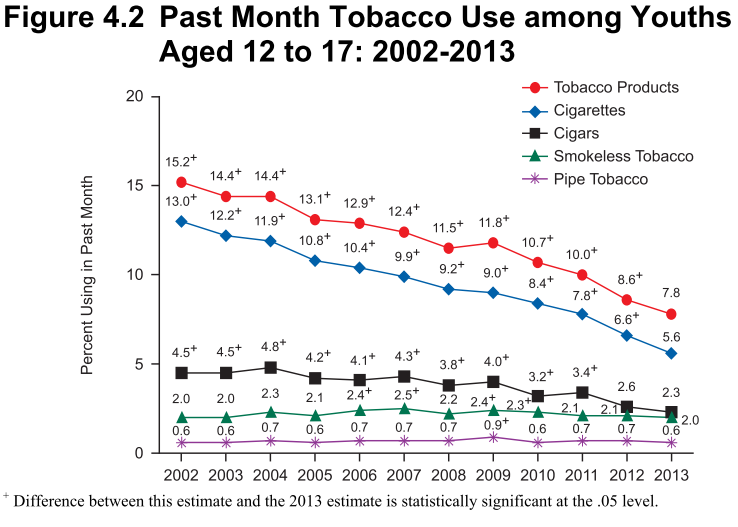 The chart at left shows that the smoking rate continued its free-fall through 2013. Cigar use also declined over the past decade to 2.3% in 2013, while smokeless tobacco use was flat at about 2% over the entire period. These figures aren’t underestimates. As I discussed previously (here), NSDUH estimates tend to be robust because they include any product use over the prior 30 days. Other NSDUH data (in the second chart) point to the population that should be targeted by the FDA and CDC – those aged 18-34. 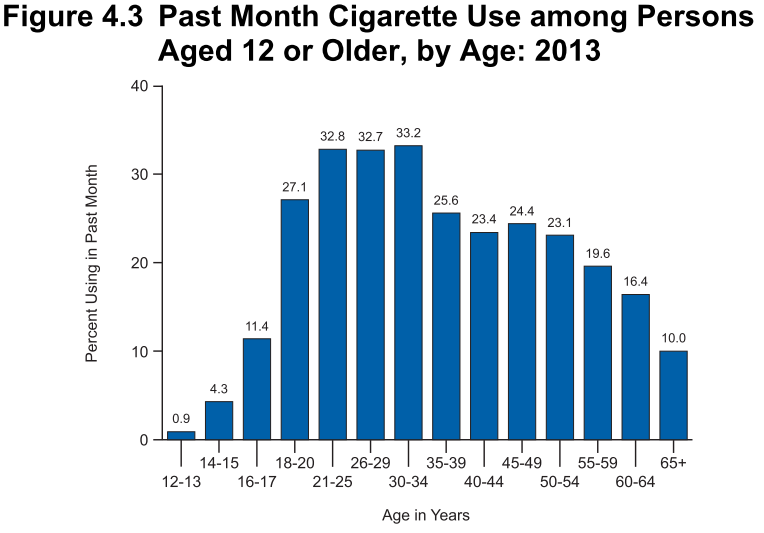 The sharp jump in smoking prevalence from 11% at ages 16-17, to 27% at ages 18-20, underscores that the latter group is where the real problem starts. Anti-tobacco forces know that problematic behaviors in adults don’t stimulate support for prohibitionist policies, so they continue to inaccurately suggest the existence of a youth-tobacco crisis. Nicotine can be detected in a chamber after releasing vapor directly from an e-cigarette, according to a report in Nicotine and Tobacco Research (abstract here) by Roswell Park Cancer Institute investigators. A Carl Phillips parody of the abstract (here) convinced me to review the journal article. Clive Bates also published a scathing critique (here). Dr. Maciej Goniewicz and collaborator Lily Lee released e-cig vapor from 100 4-5 second puffs into a 12 x 10 x 9 foot room. Meticulous collection of samples revealed that about 205 micrograms of nicotine were spread out over 81 square feet of tile floor. This is unsurprising, as most of the nicotine in vapor is expected to eventually fall to earth. Far less nicotine was recovered from vertical surfaces like walls and windows. Four years ago, I reported that third-hand smoke is an almost imaginary vector by which smokers expose everything and everyone to dangerous toxins (here). Today, smokeless tobacco users are also the scare campaign’s targets. 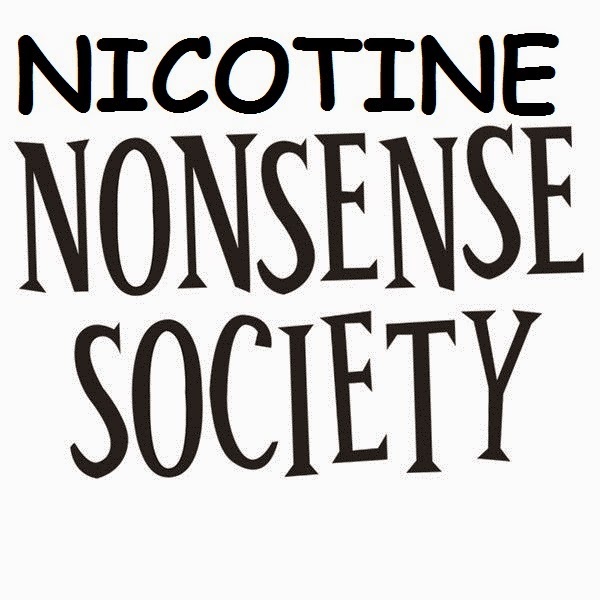 According to a 2013 study in Nicotine and Tobacco Research, “children living with smokeless tobacco users may be exposed to nicotine and other constituents of tobacco via contact with contaminated dust and household surfaces.” (abstract here). In this scenario, a child could consume 20 micrograms of nicotine, about one tenth the amount of the vapor floor-licker, by eating about one ounce of dust. Third-hand nicotine harmful? Don’t even think about it.